We welcome you to Ranua Village! Ranua Villages are local destinations that are formed around the current lifestyles of our clean countryside. Ranua Villages –brand tells that the hospitality and service are held in the core of the work. By visiting Ranua Villages you can get to know the vitality of the villages, and become acquainted with the ways to work, fish and hunt, as well as pick up berries. Asmunti is a village in southern Ranua, close to the border of Pudasjärvi. Villagers live in the area of both municipalities. There are around 100 residents in Asmunti. During Christmas time, the great spruce-trees by the road are decorated with spectacular lights. A lit skiing track can be found. When the cloudberry season is on, the vast swamps of Asmunti invite you to explore and go berry-picking. Hosio is one of Simojoki riverside villages from Ranua centre to direction of Simo. There are easy-to-explore swamp areas and for adventurers, Hosionkoski-rapids provide possibilities for rafting when the water level is high enough. You can rent canoes and kayaks nearby. Impiö village is located about 38 km from Ranua centre to east. Location creates an excellent opportunity for following the changes of lake scenery from sunrise to sunset. Visitors can experience the lake views on every direction by boat and fishing. Lakes of the area are known from their richness in fish. Local berry guide can take you also to the berry-hot-spots. Accommodation can be found in the area. Impiö-villagers get their livelihood from traditional farming, forestry and reindeer husbandry. Simojärvi-Soppana trails leave from Impiö and during winter time there is a lit skiing track in the area. 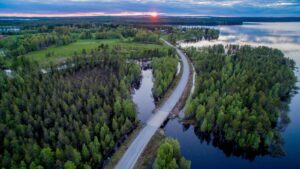 Kelankylä is close to the south-east border of Ranua and Pudasjärvi, approximately 35 kilometers from Ranua centre. 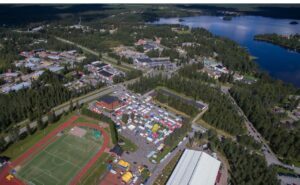 There are about 70 people living in Kelankylä. 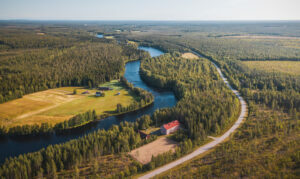 Kelajoki River and Siuruanjoki River run through the village and especially Siuruanjoki River is popular amongst paddlers. For self-guided travellers, there is a lean-to and a place to make a camp fire. 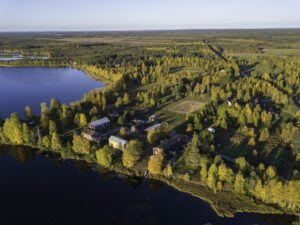 Ranua centre has been formed on southern and western shores of Lake Ranuanjärvi. Centre has the commercial and public services, and it is a meeting place, for example during market days of Hillatori market square and Golden Cloudberry Markets. For those who seek something to do, there are safari services and animals to meet. For accommodation, you can choose your favourite – options can be found from exotic ice igloo to hotel room and traditional Finnish cabin. Place names, and still partly standing constructions tell about the history of the area, and invite you to imagine the life of the ancestors. River Simojoki is famous for its salmons and it runs through Kortteenperä. Plenty of rental cabins can be found on the area, and there is also a horse farm nearby. On the shore of Lake Simojärvi, there is also an inn that survived the wars and it is still used for its original purpose. Kortteenperä has great swamp and forest areas for those who seek cloudberries and bilberries. 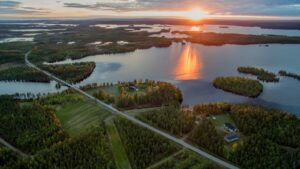 Kuha village has settled on the neck of land between Lake Kuha and Lake Kuhan Takajärvi. It is located approximately 10 kilometres from Ranua centre to east. The origins of permanent settlements in Ranua are in Kuha and there also lies currently the oldest house in Ranua. Nowadays there are about 200 people living in Kuha, and you can get to know the life of the area for example by horse-back-riding. 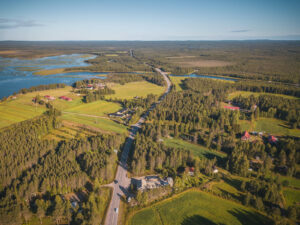 Cultural landscape of Finnish countryside is the main impression of the scenery of Kuukasjärvi. Kuukasjärvi locates 21 kilometres south-east from Ranua centre by the shores of Lake Pikku Kuukasjärvi. 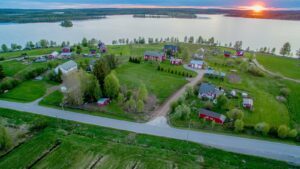 Buildings from 1800s and 1900s can be found in the village and there are few whole yards of Ostrobothnian style farms saved in the area. 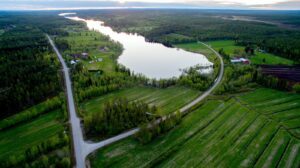 There are about 130 people living in Kuukasjärvi, and among other things, the active villagers organize Kuukasjärvi Farmer’s Market in spring time. 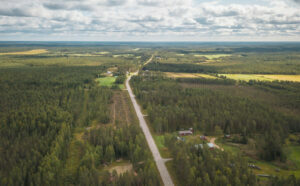 Petäjäjärvi village is located 19 kilometres away from Ranua centre to south-east. 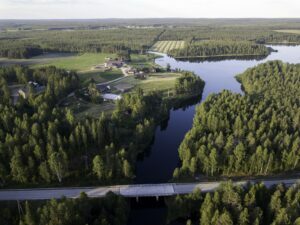 There is an organic farm in Petäjäjärvi. Pohjaslahti-Piittisjärvi is a community of two villages in the northern parts of Ranua. They are located about 46 kilometres from the centre. Area is known from it scenery of hills and lakes, and it is chosen to be the most beautiful village of Ranua. Cabin-life in the area is close-to-nature. One of the Ranua’s official docks is in Pohjaslahti. There are also snowmobile routes and a lit skiing track in the area. 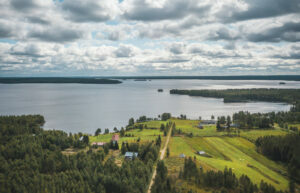 Portimo village is on the shores of Lake Portimojärvi, about 25 kilometres north from the centre. Simojoki River runs through the village. Portimo’s postal address is still Ylisimo, originating from the times when the area was part of Simo municipality. Word portimo in itself refers to ermine or to weasel, and based on other place names of the region, it can be concluded that there has been fur animals in the area. The greatest stall battle during Lapland War against Germans happened in Portimo area. Nowadays there is a monument marking the battle of Ylimaa close to the road 78, a few kilometres north from Portimo. Saariharju village is located in the east of Ranua, by the road between Ranua and Posio. It is about 31 kilometres to Ranua and 56 kilometres to Posio. There are about 100 residents in Saariharju village. Cabins invite you to stay and relax in the area.